A few days ago I rebooted an unused machine at work, that had been operating as the main server for the local network (~40 desktops) until 3 years ago. 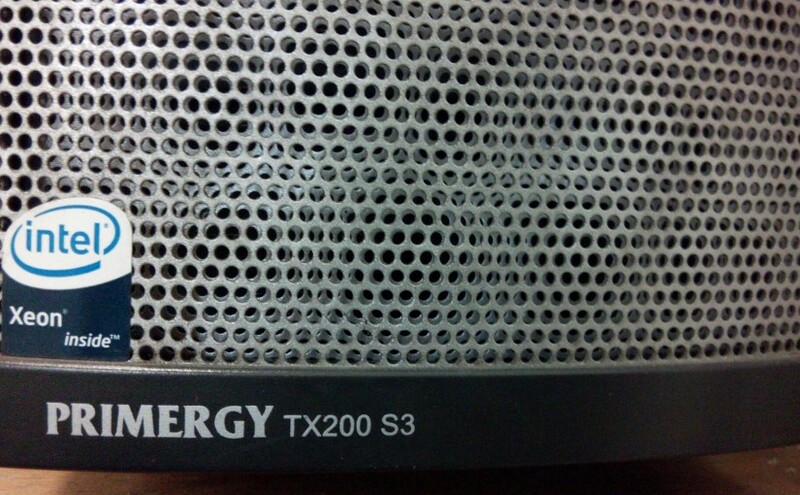 It is a Fujitsu Primergy TX200 S3, that was in production during the years 2006-2007. I found mostly old (ok, I can see why) and contradictory reports on the Web about running GNU/Linux on it. This is mostly a note to myself, but could serve others as well. I chose to install Debian on it, did a netinstall of Wheezy 7.8.0 from the netinst CD image (using an actual CD, not an USB key) and all went well with the default settings ‒ which may not be optimal, but that’s another story. While older and less beefy than its current HP companion, this machine is still good enough for many tasks. I am slightly worried by its energy consumption, to be honest. It will be used for running web services on the local network, such as Radicale for shared calendars and address books, Mediagoblin for media archiving, etc.